We know what our bodies need to be healthy, yet society makes it so easy for us to be unhealthy. Benjamin Franklin said, “An ounce of prevention is worth a pound of cure.” This quote summarizes how we use chiropractic care to help you heal. We then strive to educate you on how your problem came to be and how you can avoid it from happening again. Many adults show evidence of childhood injuries to the spine that are now affecting their health. 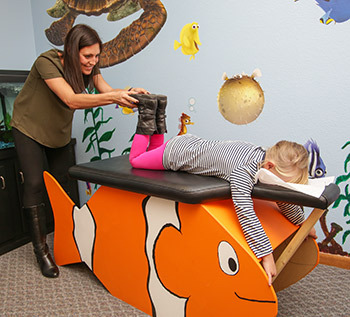 This is why we believe it’s important to ensure your child’s spine is healthy for proper development now, and a healthy life down the road. We see our patients professionally, but view them as our friends and family, always keeping their best interest in mind. We treat patients as we’d like to be treated. The quality of care is more important than the quantity of patients we see. We truly care about you. We are the only area practice that offers in-house X-rays. Seeing the smiles on patients’ faces and how happy they are is wonderful. Dr. Brad and Dr. Steph love seeing patients get better and hear the excitement in their voice. That’s where we get our drive and what keeps us going. Dr. Brad remembers one patient that came in bent over as he could barely walk. It was the first time Dr. Brad had seen a man brought to tears due to so much pain. After a few adjustments throughout the week, he was standing up with almost no pain. He was so thankful and hugged Dr. Brad, grateful for all that he did. Dr. Steph has many successful stories of children with colic, earaches and especially remembers one special four-year-old. She had had issues with her kidney and bladder since she was a child, yet after beginning care she hasn’t had any other complications. We work to help you to let your body heal naturally. Contact us at (319) 622-3322 and let us show you firsthand how chiropractic care can help.